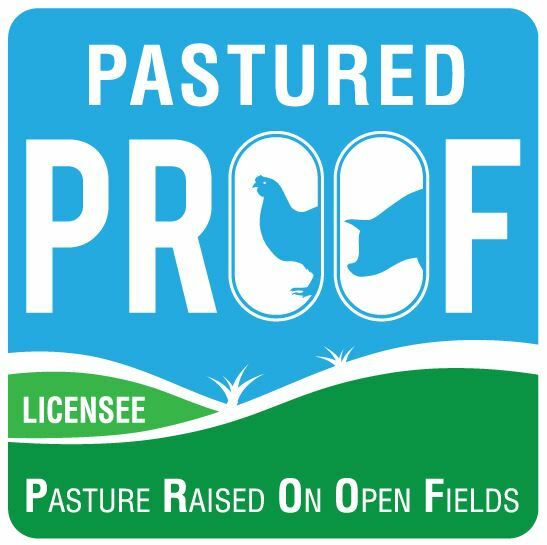 PROOF - Pasture Raised On Open Fields - How much feed does a pig need? It is one of the most common questions we hear, how much should I feed my pigs? We can tell you that a porker pig will eat an average of around 2 kilos of feed a day over the period from birth to slaughter, but, and its a big but, you must know the nutritional value of the feed you are giving your animals to know that they are receiving the correct nutrition that will maximize growth potential and produce a marketable carcass. It is alarmingly common that people do not have a clue about the feed they are giving their pigs or even the quantity that they feed. "A bucket of this and a scoop of that" is a response we hear all too often. Typically, these people have come to us because their pigs are growing very slowly, the pork is fat or the productivity of their sows is very poor. Different classes of pigs require differing levels of digestible energy (DE) and amino acids (building blocks of protein) to grow and reproduce well. The table below is a guide only for free range pigs. This table makes calculating how much to feed to the pigs simple. If your grower pig needs 32 Mj of digestible energy per day, simply divide that by the DE specifications of your feed. For example: if your feed has 13 Mj/DE, divide 32 by 13 = 2.5kg of that feed per day. This table is only a guide because pastured producers will be using different genetics and often slower growing heritage breeds or their crosses and their needs will all vary. Its one thing to have the correct nutrition for your pigs, its another to ensure that they are getting enough food or are not overeating (and costing you money!) or being underfed and unable to maximize their growth potential. The following guidelines assume that you are feeding optimum and balanced nutrition to your pigs. 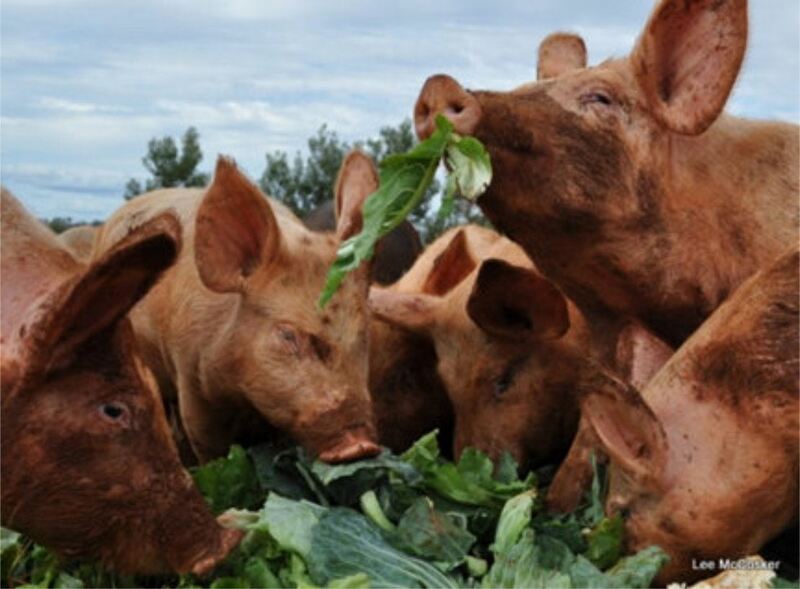 Dry sows will eat approx 2.2 kilos per day depending on their size and condition. Feed can be gradually increased in the last month of pregnancy. Sows with young should have access to as much good quality feed as they can eat. This will ensure fast growing healthy piglets and that the sow will not loose too much condition while lactating. Without going into complex nutritional guides, feed these sows an equivalent of a grower pig diet if you are unsure or do not have access to a specialized feed. There are 'Lac Sow' feeds available. If you are a larger operation, we are sure you are already aware of the dietary needs of the lactating sow and how important it is to feed her well. Also make sure that the sow's piglets are getting feed by making sure feeders are an accessible height, if not, you will have to provide a feeder for the purpose and possibly set up a barrier around it to stop sow access. Piglets must be eating well before they are weaned, at least 250 grams per day. This is a great time of stress for the young piglet. To ensure their condition does not go backwards, a high grade feed must be offered. A commercial, bagged feed (without any added drugs) will be an excellent way to prevent this and get the piglets growing. It will be high in protein and energy and contain sweet flavourings to attract the pigs and increase appetite. If you are mixing your own, the addition of skim milk powder will aid in greater acceptance of the feed and increase intake. At around twelve weeks of age, or when the piglets are eating extremely well and consuming over 1kg each per day, you can start introducing a grower ration. Do this over a few days by mixing the two feeds together. In a large scale piggery, you will find that a lot of different diets are used for different stages of growth, even for the different sexes. This is really difficult to do on a small scale. For maximum growth, pigs can fed adlib until around the weight of 50kg. Controlled feeding may be necessary after this stage. Once a day feeding in a controlled situation may prevent probems with dominant pigs that gorge themselves at two sittings. Once a day feeding means that once the more dominant pigs have had their fill, they move away and let the others feed. This is why the adlib self feeders in the paddocks work so well, there is always feed for all pigs, even if they have to wait their turn. 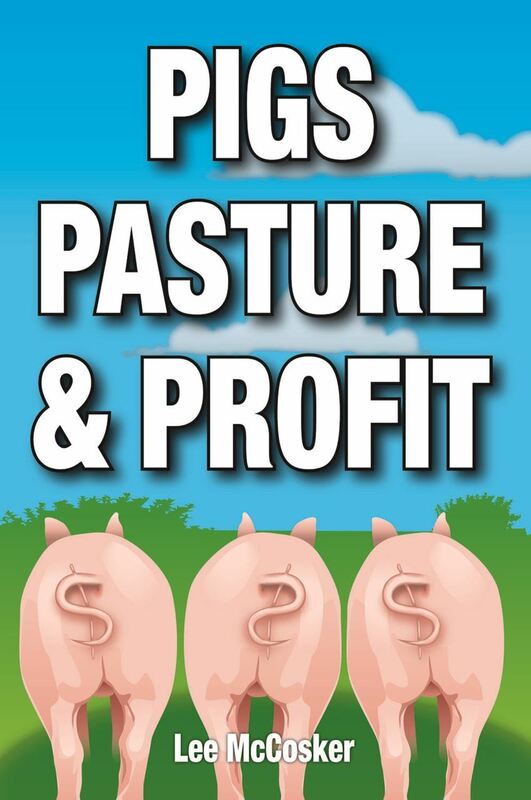 If you choose to move the pigs into smaller paddocks, or even control with daily feeding, pig over 50kg should have around 2kg of feed, increasing to 2.5 by 60kg. This will depend a lot on the breed and genetics of your pigs. If you plan to take your pigs to heavier or baconer weights, this will increase further to around 3kg or more a day, depending on the weight of the pigs. Again, know what you are feeding your pigs so that you can accurately calculate how much to feed. Tip: When using self feeders, place the feeders a distance from the water supply. If pigs have free access to feed with water close by, they tend to gorge themselves and exercise little. Forcing them to walk a distance (not too far, 100 - 200 metres will do) will slow down consumption to acceptable levels. Also, dont place the feeders in a comfortable position like under a favourite tree. Not only will this encourage over eating and little exercise, it will deter shy feeders if other pigs are laying around the feeder.